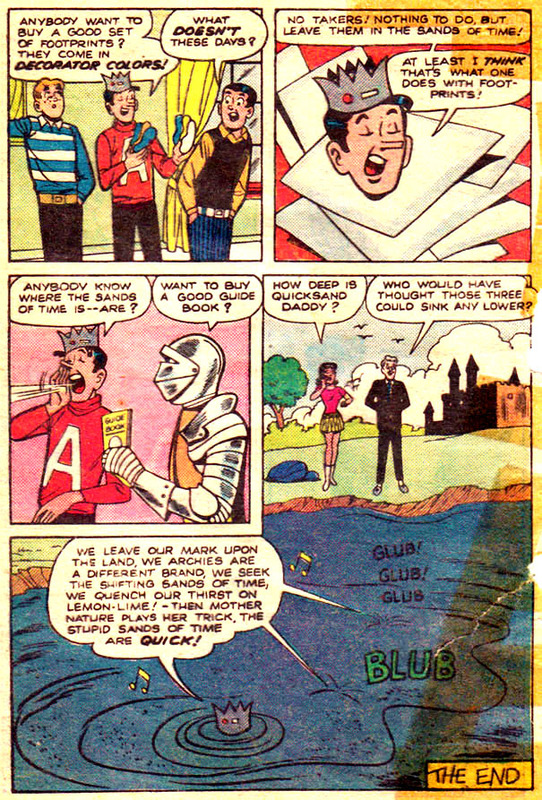 A fellow blogger, Ripplin, scanned an Archie comic for me a few weeks ago, and I'm still scratching my head. It's not just bizarre, it's not just intentionally quirky..... it's..... well, f***ed up. I'm sorry, but there's no other word for it. Perhaps as a result of widespread drug experimentation, comedy got a bit surreal in the latter half of the sixties. Think about Laugh-In, Monty Python, and Casino Royal - the humor was derived from being ironic and unusual.... even The Monkees and kids shows like H.R. Puffinstuff often ventured into the eccentric. That being said, this one seems to push the envelope to the point where I'm convinced lysergic acid was involved in some form or fashion. It's so bad it's nearly unreadable, but I can imagine it would make for an interesting read whilst under the influence. Like I Am the Walrus, I'm sure this is littered with hidden meanings, but I'm just too straight to understand any of it. If anyone out there is currently tripping, please interpret this for us! it's like the ramblings of a 7 year old in the grip of an extreme sugar spaz-out. I wish I was trippin' so I could understand this! Its trying to be edgy, wacky, slap-sticky at the same time, but somehow its just a jumbled mess. I think they're trying to do a MAD magazine-style parody...to themselves? I want to give them the benefit of the doubt and say that the parties involved were taking the opportunity to use every inside joke ever, and that it all made sense to them, and only them. But I suspect they were just following the amateur cartoonist school of comedy; throw out a bunch of nonsensical crap and somehow it will be funny. This is a bipolar writer's episode of mania. Or just an ordinary jerk trying to be surrealistic. Dig it, man...they were, like, stoned, baby...like, it was a one-way type trip to Stonesville, Jack...like...whoa...like, what's in these brownies, man? 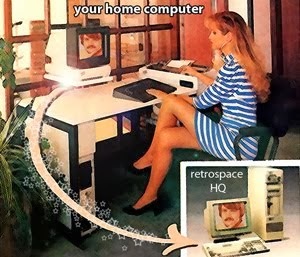 heeheeheeheeheeheeheehee...cool. It's a lot simpler than you folks are making it out to be. It's not even remotely like drug humor. I see a very clear effort to emulate/pastiche the style of The Monkees here, at a time when the series was still on the air. It's like the part of Laugh In where they all pop out of the little doors, but without a shred of taste or wit. Thanks again, Gilligan. :) Wow, you sure brightened it up! Anyway, yeah, quite bizarro. Seems like forced stream of consciousness (if such a thing is truly possible), mixed with wordplay and random nonsense. A friend in high school gave me this, saying his brother wanted me to have it. No idea why. That was back in 1995 and I kept it all this time, so I guess he was right to give it to me, knowing I'd dig it. I dunno. Sort of reminded me of the Marx Bros. 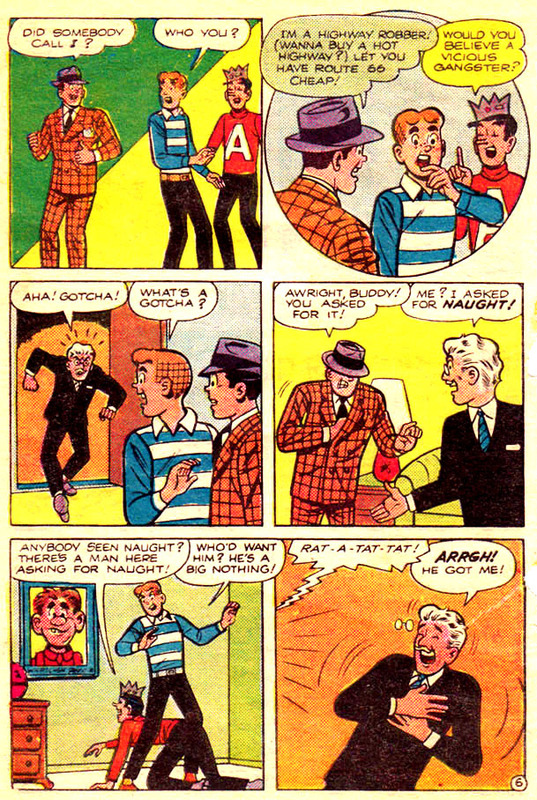 These early "Archies" stories were written by Frank Doyle (Archie's head writer; nearly everything in the '70s Archie collections is written by him) and drawn by Bob White. 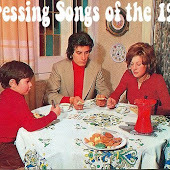 They were silly, but I was never confused by them as a kid; I read them all and understood that they were just anarchic silliness in the vein of the Marx Brothers and the Monkees. 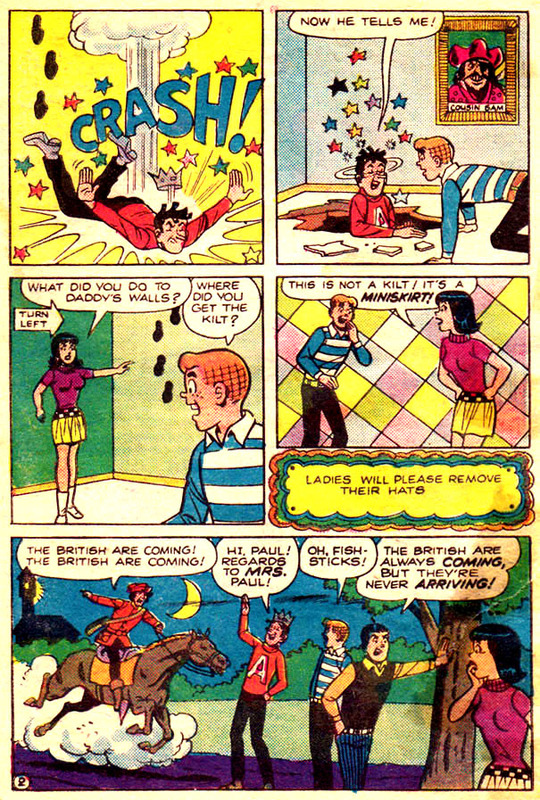 "The Monkees" inspired the creation of the Archies and then "Laugh-In" made non-sequitur comedy very popular, so there was just something in comedy at the time that created this kind of thing. But really it all just goes back to Vaudeville, and Doyle was always happy to use any Vaudeville joke he could think of. Most of these jokes were pretty accessible/understandable in that cartoony kind of way. I agree with Jaime, Kids loved (and still love btw) 'anarchic silliness' and 'non-sequitur comedy' These comics were just like The Monkees TV show, every bit as slapstick and vaudeville-like with the "over the adults heads" humor that kids could feel superior to for "getting it" (or to quote another post here, non existant humor [Gold!]) On an unrelated note..... I found the "The British are coming but never arriving" quip hilarious. I can't imagine how that got by the censors. Okay I'll bite. 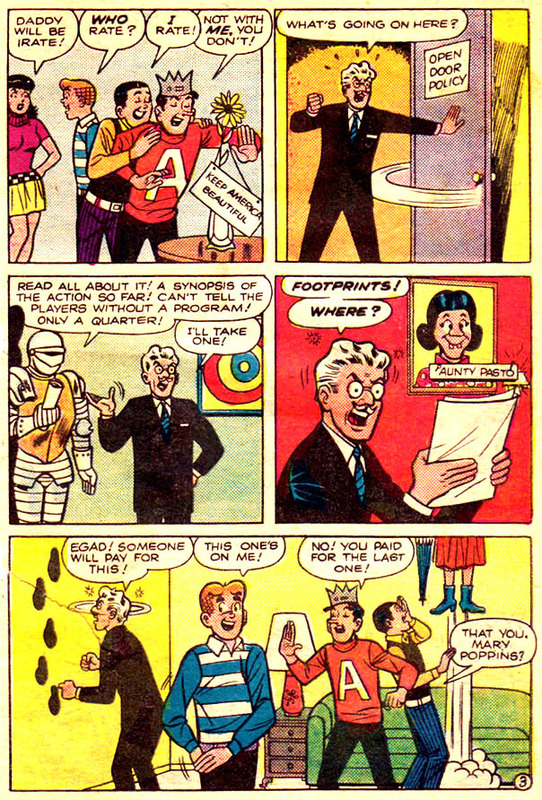 Was this from an actual canonical issue, a limited-edition satire (maybe inside one of the Archie record albums - the Ripplin link is mostly scans of 70s albums) or a unauthorized rip-off? Nothing turned up on my google search, and this doesn't look like it came from Mad, Cracked or Crazy. The tape and water stains look very real; if this a recent Photoshop fake it's VERY good. Spire Comics produced ~20 Christian Archie comics in the 70s, written and drawn by Al Hartley. I'd be interested if any adults-only or non-CCA Approved alternative Archie comics were also produced. 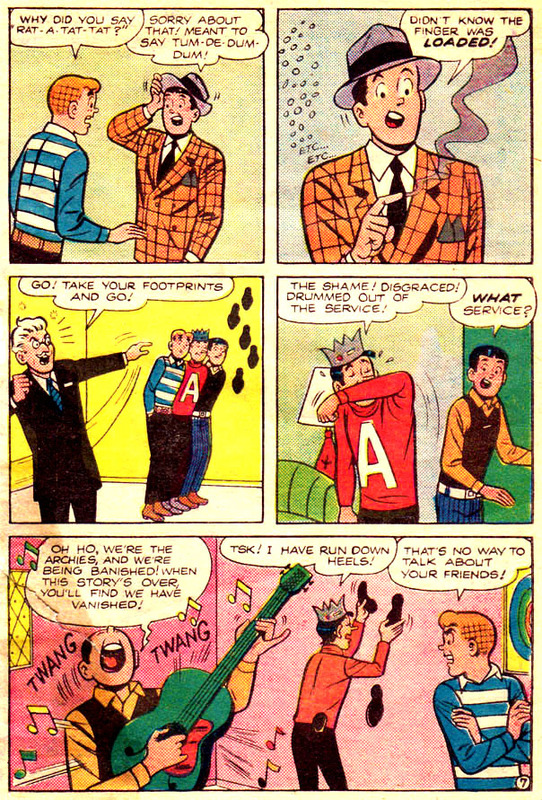 It's just a story a guy ripped out of a regular ol' Archie comic for me. No more, no less. 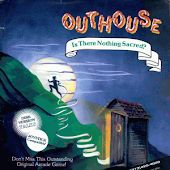 I was going to submit this to my retro blog, but decided Gilligan should have it. 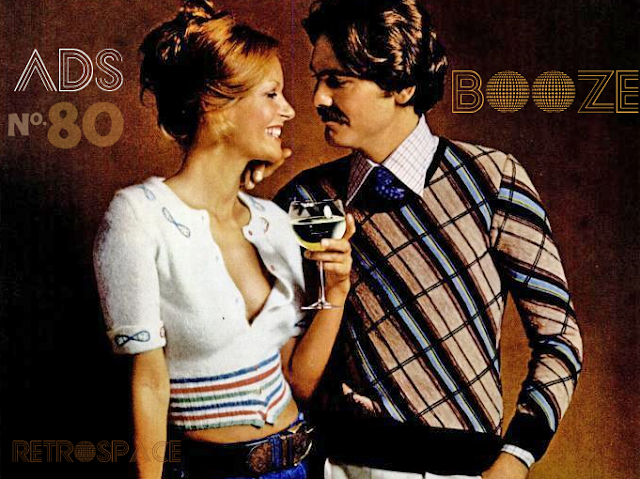 My vinyl blog is my main/favorite one, which is why it's linked to that rather than the retro one. 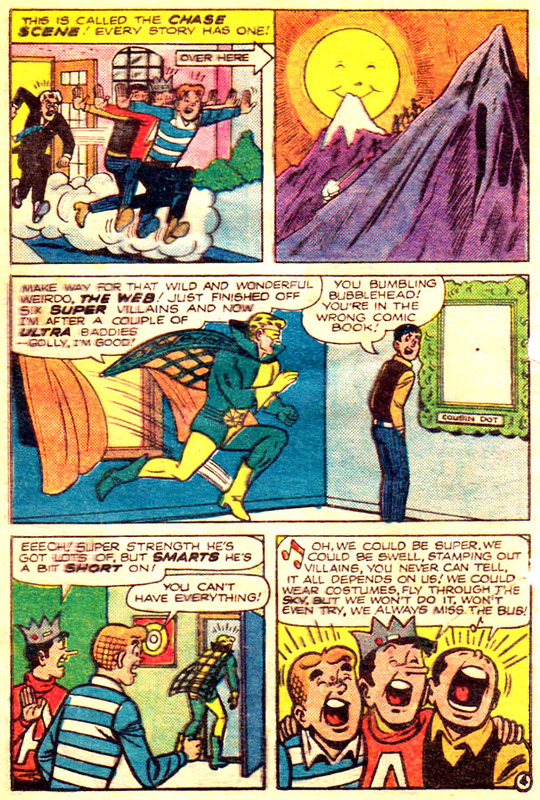 The writer obviously took in two or three MONKEES episodes, and keep in mind the same kind of 20-gags-per-panel comics comedy was readily seen in MAD and such, and Marvel Comics' concurrent NOT BRAND ECCH comic! 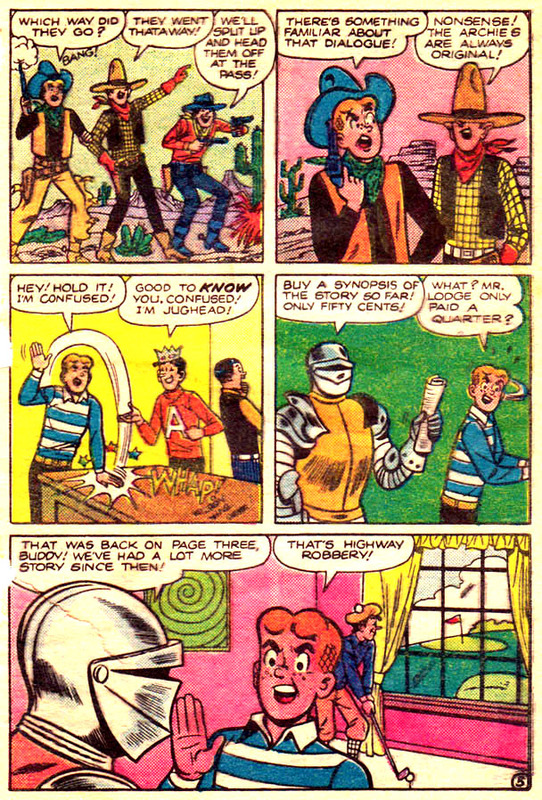 More Monkees connections-they used knights and armor in many romps and bits...for their aborted third season, they wanted to change to a format more like LAUGH-IN would do when it debuted the next season...Don Kirshner (early musical director of The Monkees) went on to helm the ARCHIES project, knowing fictional cartoon characters would never strike for artistic reasons, like the Monkees did! 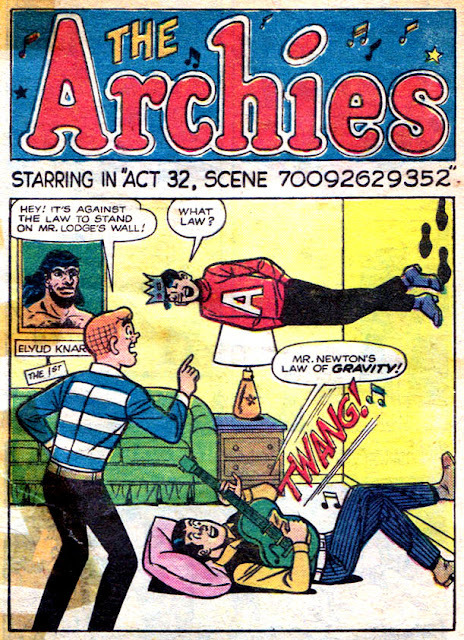 The are The Archies on drugs. Any questions? The inspiration is almost certainly the Monkees theatrical film, "Head".